Have you heard “Food before one is just for fun”? I have seen our community members post it in our support group, asserting that all babies need for their first year of life is breastmilk. I feel compelled to clarify that we don’t believe this to be true. Food before one is definitely much more than just for fun, as Jo McKinstry, Accredited Dietician, asserts in her article ‘Food Before One Is Just For Fun’ – Fact or Fiction? 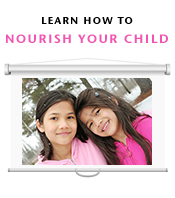 Sally Fallon Morell and Dr. Thomas Cowan, MD, write in their book The Nourishing Traditions Book of Baby and Child Care: “Somewhere between the fourth and sixth month, baby should be started on solid food. The exact moment depends on the size and maturity of your infant. Babies who have reached twelve pounds and who are achieving their milestones (see pages 174-79) are probably ready for solid food at age four months. Infants ready for solid food will stop pushing their tongue out when a spoon or bit of food is placed in their mouth–a reflex common in infants that disappears at around four months of age. For less mature babies, wait until five or six months. But by the halfway mark to baby’s first year, he will need solid food in addition to breast milk or [homemade] formula. See our Resources for Baby’s First Solid Foods, and my recent review of Nourished Beginnings. What has your experience been of introducing solid foods? 8 Responses to Food before one is not just for fun. I didn’t know as much about nutrition then as I do now but it always seemed logical to me to breastfeed babies and when you could put a spoonful of food in their mouths and they swallowed it and wanted more that they were ready to eat. Sucking puréed food out of a bottle did not seem natural nor did not feeding a baby that was watching you eat and licking their lips. With one of my eight children, life was rough, she was hard, and I was overwhelmed, so I took the La Lache League approach and didn’t worry about food until she turned one. She has been our difficult child in all respects and is now 18 yo. All my others were eating some serious food by age one. So this resonates with me. My daughter refused all offered solid foods consistently until well past the age of one year. She was a cheerful, robustly healthy infant; even chubby from months one through six. after the sixth month, she was so actively cruising, climbing and walking that she stopped being chubby, but she never got poorly-looking, or lost her rounded childish body and face. She was very alert, very investigative of her surroundings, cheery and active and sweet-natured despite being from birth a high-need baby with high sensitivity to environmental factors. (I’d had a very stressful pregnancy and long, challenging delivery, but no interventions.) She was a lousy sleeper, and preferred to be busily engaged in exploring her world. As she continued to grow and had no signs of ill health or developmental delay—to the contrary, she was always hugely in advance of benchmarks in physical capability or mental function—I didn’t worry. Her weight to height ratio was low after she stopped being chubby, but within normal parameters for breastfed babies. At intervals, from about the 4th month, I would offer her a mashed bit of whatever we were eating, but she spat out every bit of it until well past her first birthday. The first thing to meet with approval was mashed avocado. Guacamole, actually. She continued rejecting most foods in any appreciable quantity for some time longer; I don’t recall her consuming more than a single bite of anything until she was nearly three years old. At that point, she began to eat a few bites of most anything, until it looked like a more reasonable amount of solid food was being consumed most days. She weaned herself at a little past four years old. I offer this perspective in support of the idea that we should be informed and paying attention, but also remembering that each child (and each mother-child dyad) is different, and listening to one’s baby/child and one’s intuition can be as important as any other factor. I was at home with her, and thus able to know exactly what was going on all day and night. I could see that she was thriving and developing normally. My situation, and my baby, were different to many others, but also, I believe, not unusual for a high-need/sensitive infant. Very informative indeed, thank you for this! :) As a dietitian, I agree! my son wanted nothing to do with food until about the age of 1. he started eating at about 10 months only because I had to go back to work, but would only eat at day care. I also recently read an article showing how an increased amount of iron allowed for more pathogens to survive… showing a possibility that a mother’s milk naturally decreases in iron amounts to reduce the possibility of getting sick. I feel like it really depends on the baby! There was no way my son was eating as a staple before 1 year. I mentioned to my Health Visitor about giving my baby liver at 6 months and she advised strongly against it because of the high levels of vit A in liver which can be dangerous.